"This 15-piece set ensures you have all of the eyes, mouth, scarf and more to make a picture-perfect friend for your front yard." "Available in a unicorn, penguin, polar bear and flamingo giving you four characters to chose from." "This brand makes four sizes of shoes so they can fit children and adults alike." "Works of winter wonderland art will grace your lawn when kids are armed with this snow art kit." "This kit will allow kids to create some truly amazing snow structures." "You don’t have to head to the slopes to give them the thrill of whooshing through the snow on a snowboard. " "Snowball battles will reach epic proportions with these snowball makers." "The blast off can be so much better with this snowball slingshot that will propel all those snowballs through the air." "Designed for kids ages 18 months to four it’s the perfect first sled to get them in on the powdery action." "You simply sit on the seat, hold onto the handle, pick your feet up, and go, go go." While cobbling together a snowman with what you have at home is part of the fun — this 15-piece set ensures you have all of the eyes, mouth, scarf and more to make a picture perfect friend for your front yard. Kids and adults alike will create lasting memories with the reusable pieces in this kit that can be used year over year on those oh so fun snow days. If you get sick of the same old face on your snowman, use some creativity with what you have at home to customize this kit. Far from basic, this snow tube ensures all eyes will be on you when you hit the slopes. Available in a unicorn, penguin, polar bear and flamingo giving you four characters to chose from or perhaps one for each family member. Equipped with handles so you can hang on when bumps occur this tube is fun for the whole family. It's also made with thicker material than most tubes to ensure it doesn't rip or tear and it also fills up in seconds so you don't waste precious sledding time. Besides sledding, snowshoeing is a fun and super active activity that the whole family can get involved in. Use them in your backyard or perhaps go for a hike. You'll be amazed at how challenging walking in the snow can be and how pretty the snow covered forrest looks. This brand makes four sizes of shoes so they can fit children and adults alike. For more stability in deep snow or steep hills we suggest adding a pair of ski poles for added balance. Works of winter wonderland art will grace your lawn when kids are armed with this snow art kit. Color creations will stand out on the huge, white canvas the snow provides. The kit comes with three Sno-Markers in red, green and blue (no yellow, because, well… you know). You simply mix the color packets with warm water in the bottles, and they're ready to paint the town, or at least your yard. The kit also contains snow molds in the shape of a star and snowman for extra creative fun. Though the materials are safe and non-toxic, the kit is recommended for kids five and older. Don’t forget to take pictures, because these works of art can’t be hung on the refrigerator and they’ll be gone when the sun starts to shine. Forget the sand, snow castles are where it’s at come the winter months. There may be no waves lapping in the background, but this kit will allow kids to create some truly amazing snow structures. It comes with three plastic shapes — a large rectangle, a medium rectangle and a turret, because every snow castle needs turrets, of course. Each piece is made of sturdy but lightweight plastic and comes complete with a handle for easy building. Recommended for ages three and up, kids will play all day building whatever their imagination inspires. The only limit is how much snow is on the ground. When summer comes around, you can also take these molds to the beach for spectacular sandcastles and hear those waves lapping once again. You don’t have to head to the slopes to give them the thrill of whooshing through the snow on a snowboard. This one works on flat snow-covered surfaces with just a push of the foot, and it’s a blast on powder-covered hills as well. You can adjust the height of the handle to accommodate riders of varying sizes, and the handle folds down to make taking it on the go and storing it easy. It’s also equipped with a light for maximum visibility. Designed for kids ages four and up, it can hold up to 220 pounds, which means mom and dad can take a turn too if they dare. It also works on grass and carpet, so it can be used year round and is available in green, blue or red. Ready, aim, fire! Sure, you can make snowballs the old fashioned way with mittened hands, but snowball battles will reach epic proportions with these snowball makers. They’re a cinch to use and safe for kids of all ages. You simply scoop up the snow, squeeze the handles together, and voila, two perfect snowballs. You’ll create an impressive arsenal in no time flat. The fire is all friendly though, as each snowball is imprinted with a smiley face, which makes them the happiest snowballs you’ve ever seen. The pack comes with five snowball markers, so each family member can have their own, and they can be used for sand or mud fights as well, depending on mom and dad’s tolerance for a mess. Once they make all of those snowballs, they’re ready to aim and fire. But the blast off can be so much better with this snowball slingshot that will propel all those snowballs through the air at whatever or whomever they’re trying to hit. And watch out, because this one holds up to three snowballs at once. Can you say ambush? It also includes a target, for maximum aiming abilities. You simply load in the snowballs, pull back, aim and then send them soaring. It’s inexpensive, so you can grab several, and then let the games begin. Designed for kids eight and up, they’re great for parties, as stocking stuffers or just because. This sweet seal sled is perfect for the smallest sledders. 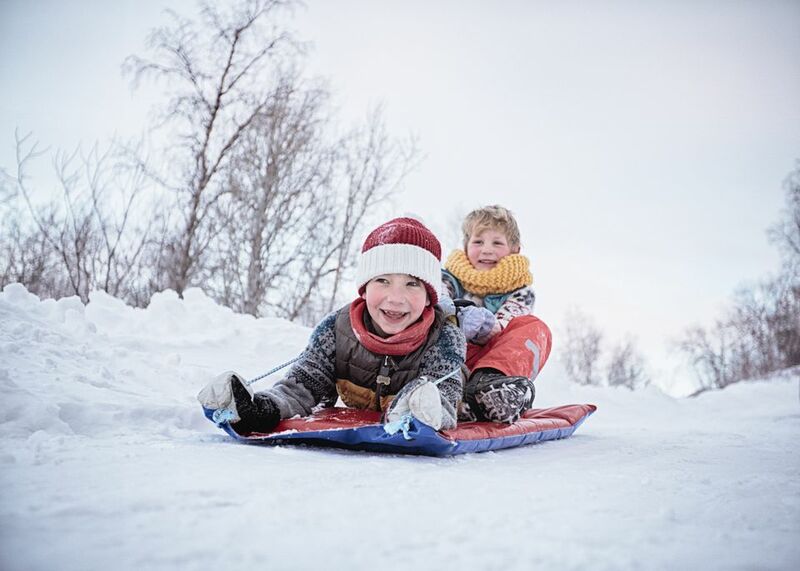 Designed for kids ages 18 months to four it’s the perfect first sled to get them in on the powdery action. The high-back and safety straps keep them secure when you're pulling them through the snowy fields. And some reviewer's have even pulled their kid inside on the carpet before the frost hits! Bright and cheerful, this is one all the kids will be begging to ride. The price is right too (read: low), so it makes a great gift. They’ll leave everyone else in their powder when they soar through the snow on this luge sled.You simply sit on the seat, hold onto the handle, pick your feet up, and go, go go. To slow down or stop completely, just put your feet down. To steer, just lean toward the side you want to turn. This sled is lightweight (just 3.4 pounds) making it easy to steer and easy to carry up the hills after zooming down them. Designed for kids ages five and up to 250 pounds, this is another one mom and dad might want to hop on for a ride. It comes in a variety of bright colors, and its unique design will certainly stand out on the slopes.